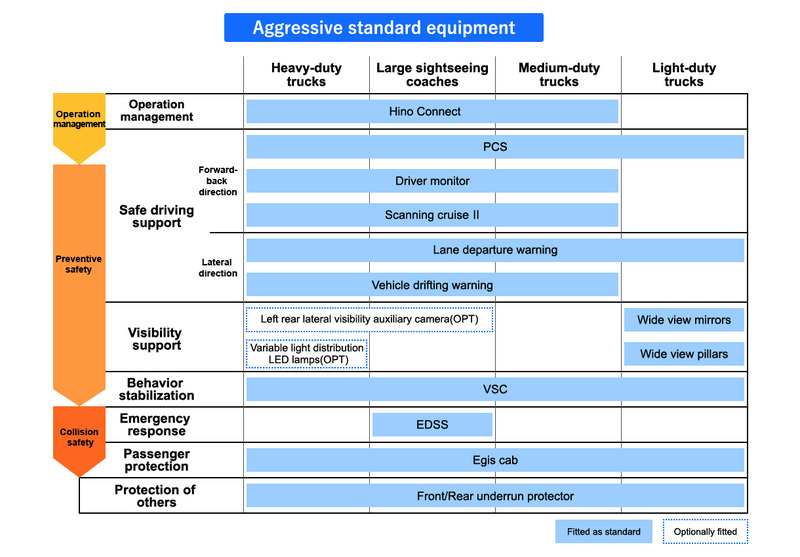 Hino Motors has worked toward the spread and promotion of safety technologies by pursuing safety technologies from two approaches: the "people" approach achieved through support for safe operation and the "vehicle" approach achieved through pursuit of vehicle safety. Hino has made efforts to provide support, raise driver safety awareness, and manage safety during driving by offering safe driving classes and implementing HINO CONNECT support utilizing ICT services. ※This service is available within Japan. 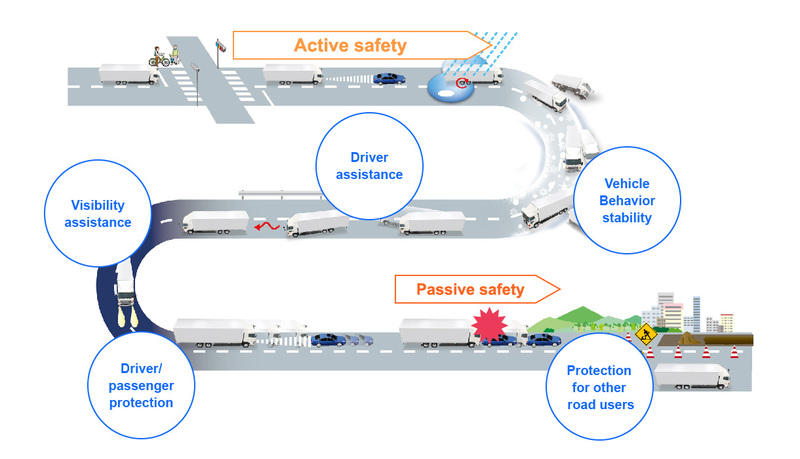 Based on the CAPS (Combined Active and Passive Safety) concept, Hino Motors has developed active safety to contribute to prevent accidents before they occur and has developed technology for passive safety to reduce damage when accidents do occur. We have put safety technologies into practical use in all kinds of situations. We lead the industry by pursuing new technologies, promptly introducing these to the market (fitted as standard) to promote dissemination and utilization of technology. ※Here are some examples of initiatives in Japan. ※PCS =Pre-Collision System. "PCS" is used for function explanation only. ※VSC =Vehicle Stability Control. "VSC" is used for function explanation only. In order to reduce human error, which causes at least 90% of traffic accidents, we tackle to develop advanced automated driving technology. 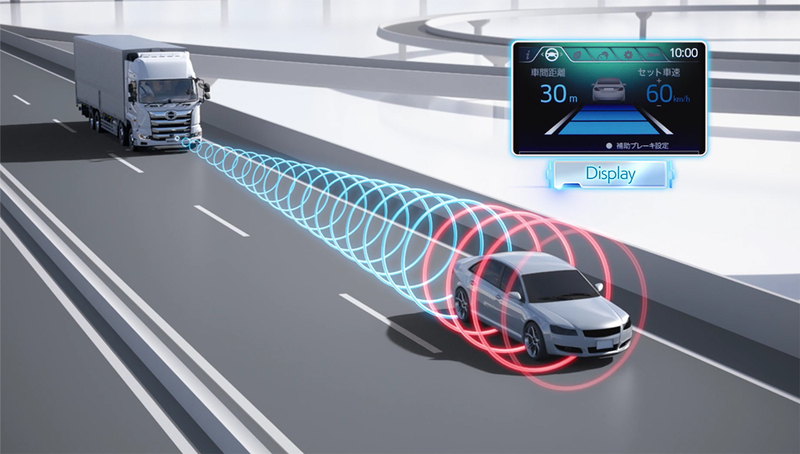 It is said that at least 90% of traffic accidents are caused by human error, including driving errors, errors of misjudgment, failure to confirm safety, etc.In order to achieve zero traffic accident casualties, we believe that developing advanced automated driving technology and preventing the occurrence of human error in advance will be effective. We are undertaking development of automated driving for practical application as a technology capable of contributing to solving social problems such as reducing traffic accident casualties and driver shortages, securing means of travel for depopulated areas and elderly people, eliminating traffic congestion, conserving energy, and more. In light of the needs of customers and society, social infrastructure including legal regulations, social acceptability, and maturity of technology, we will work steadily toward application of technologies that are useful to society. *1 Lidar is a technique for measuring distance and direction to an object by measuring the time it takes for a laser beam to hit the object and bounce back. *2 ECU is a computer that controls various functions of the car. 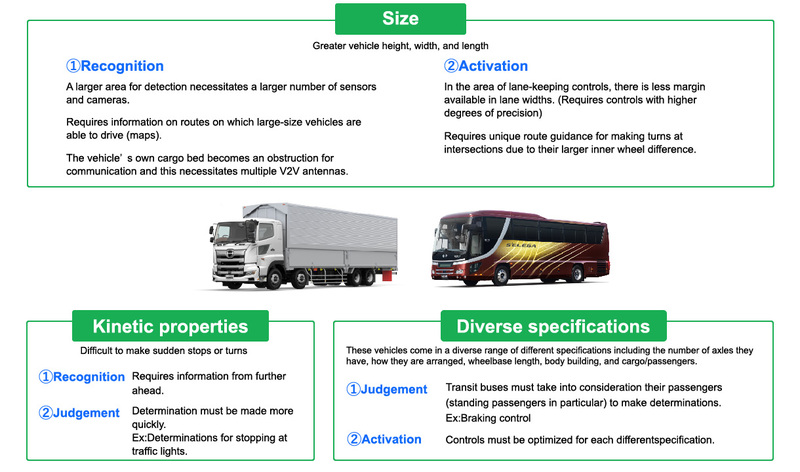 In developing automated driving technology, there are technical problems unique to large-sized vehicles. As these vehicles are both heavy and large, they have difficulty moving quickly, so a wider range of detection and rapid judgment are required. It is also necessary to optimize the controls to suit a wide range of specifications. 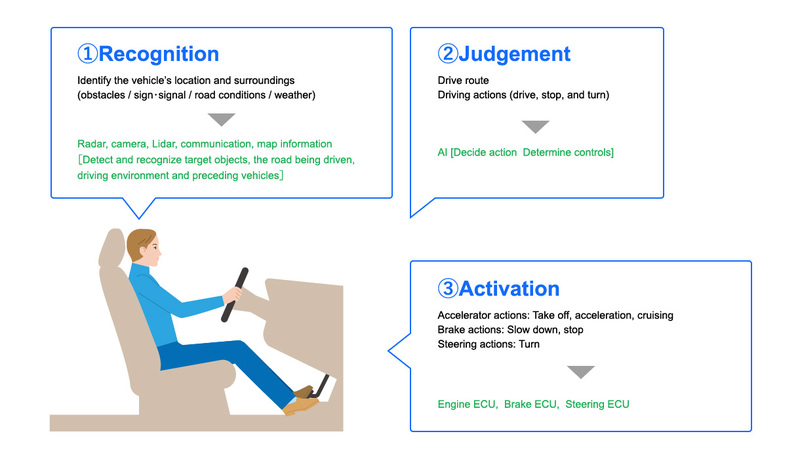 Here we introduce the automated driving technology currently under development, divided into the four areas of "Acceleration/deceleration control," "Steering wheel control," "Identifying own vehicle/surrounding environment," and "Emergency actions." Automated driving technology can contribute to solving various problems in modern society as well as helping to achieve a safer society. Here we present some examples of application of automated driving technology.